this is the wonderful load of goodies that Joy sent me. 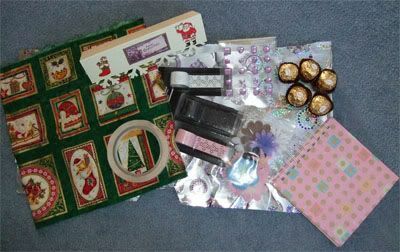 There is a fat quarter of Christmas material, could do a cushion or some little decorations with that, double sided tape, shaped lilac gems, edging tape in pink black and white, flowers in all types and sizes,chocies and the most scrummy handmade book/album ready for me to fill. I love it all. THANKYOU SO VERY MUCH JOY. What a lovely idea, that material is fab. Ooo that looks lovely, I got some material year before last, no idea where I've put it thou !! !